Many years ago, kings had the feeling that they were living for too long in peace, without fighting. But because they wanted to remain friends, so they agreed to do some friendly skirmishes. Once in a while, they gathered their armies and competed in a tactical struggle in the valley. Spells were allowed, and blood was not just for decoration. This time, people died just for the pleasure of their masters. 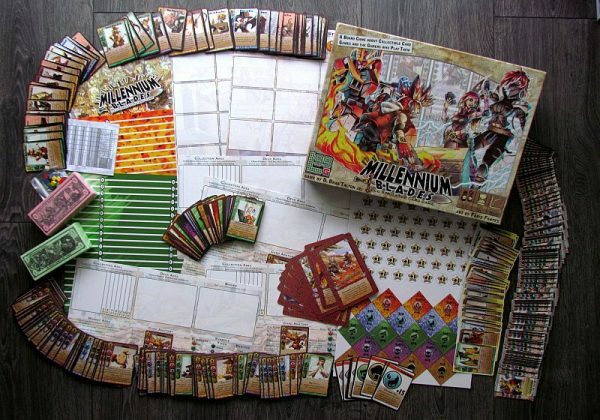 And motives of this ancient game, on a completely different planet called CCG, is based a new game called Millenium Blades. We do not know, how designer D. Brad Talton Jr. learned it here on Earth, but we owe him for the chance to play it on our own. This is a game released by Level 99 Games with illustrations by Fábio Fontes. The game was released for the first time in 2016. Home to this game is a really massive box, that is not only big, but also very heavy. 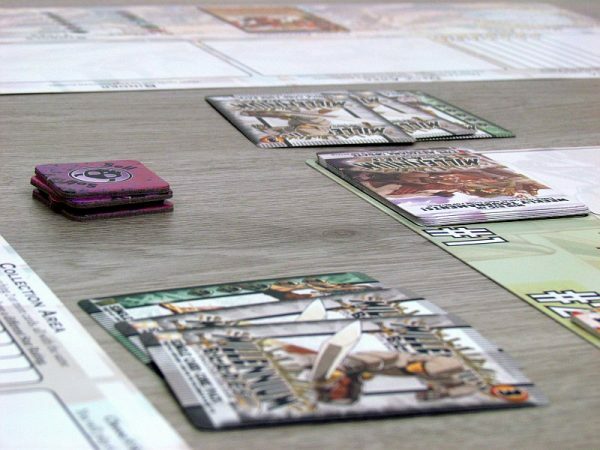 There are a total of five large, double-sided gaming boards made of thick paper. Players will find a number of interesting information and texts relevant to the game, but also three card areas – space for tournament deck, binder for card collection and space to place card collections to be scored. This side is used during deck-building, while the other is dedicated to the tournament. With these boards, bottom part of the box is also covered by two common boards – shop and aftermarket with lots of spaces for card offer. Basis of everything is a huge number of different cards, namely more than six hundred. One bin in the box is occupied by paper banknotes – there is eight hundred of those! 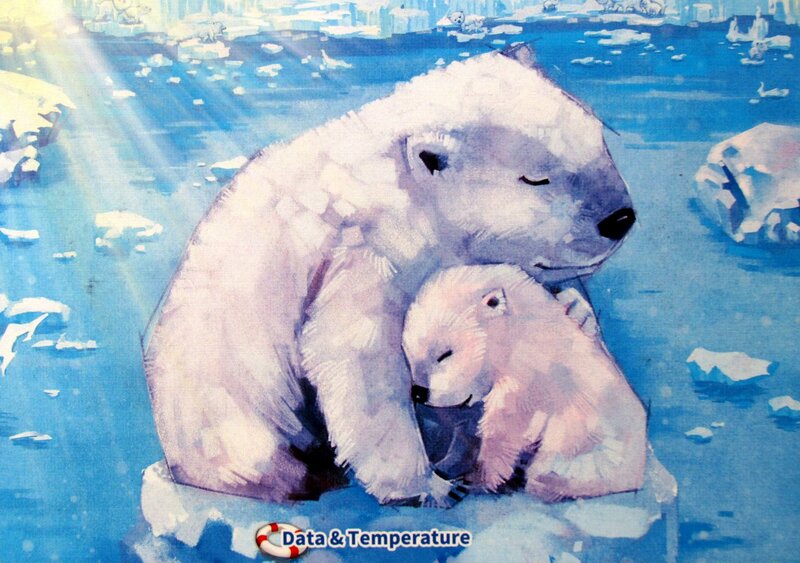 However, do not be afraid – you will not be using one paper at a time. 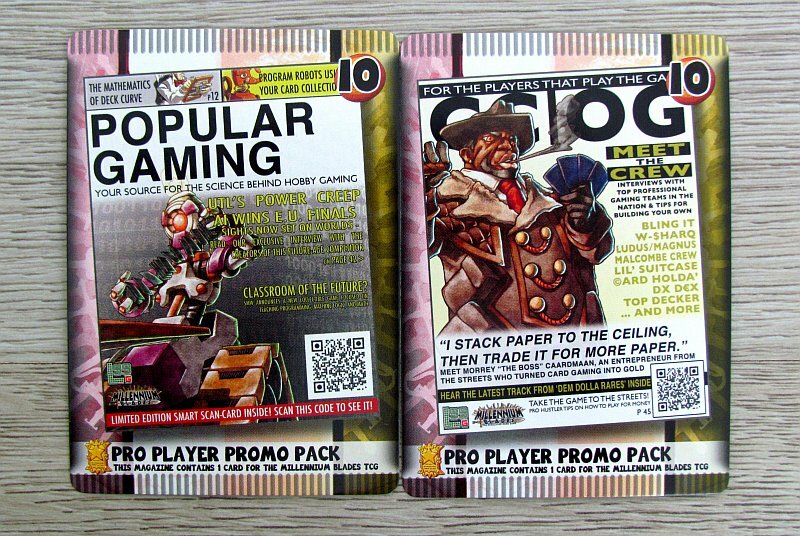 Instead, there are tapes, prepared for players to bind them into packs of ten. And this is an activity, that will take up a moment of your time, once you unpack the game for the first time. 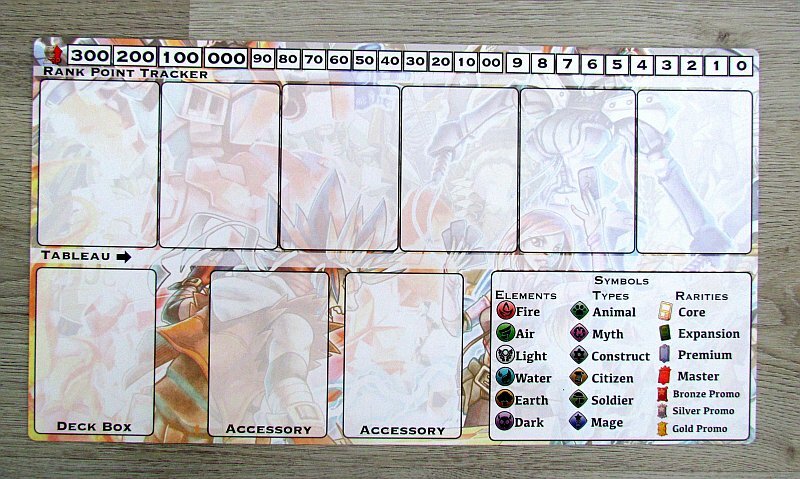 In addition, there is a scoring pad and a number of tokens in the box as well. At the beginning of their match, players will need a big table to place a common board waiting for the offer cards. 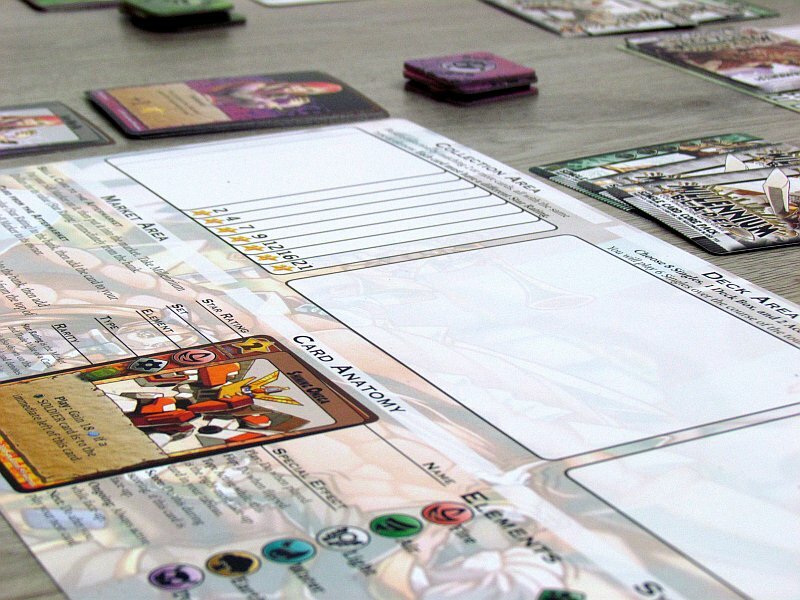 In close proximity, players should also put their own plans. 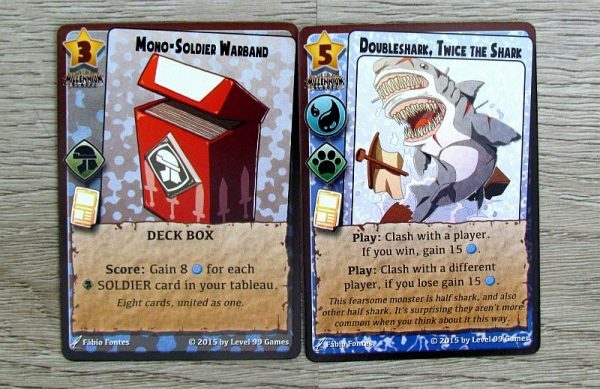 Together, they prepare a selection of cards, based on the core set, which is then enriched by random or selected sets of expansion cards, premium and master sets. After shuffling, a shop deck is created. 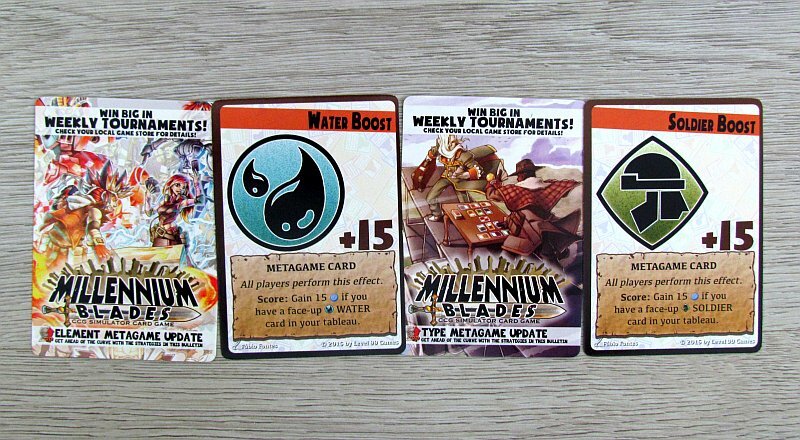 Nearby, its also needed to place promo and meta card decks. Players then pick up their character (collector), get a starter set of cards, three random cards from shop deck, a set of friendship cards worth victory points to award during gameplay and sales tokens. Setup ends with creating a moneybank. 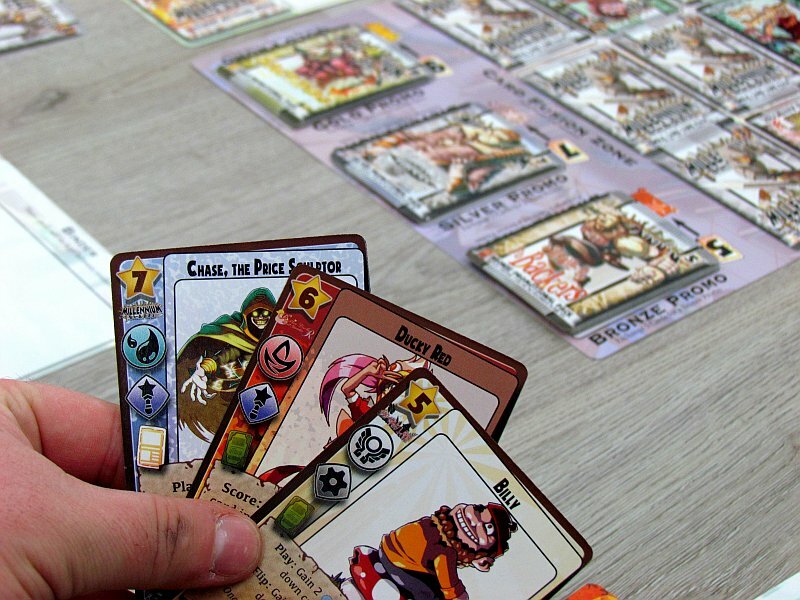 Game is divided into two rounds – a preparatory round of building a deck is followed by a tournament, in which most victory points can be won. 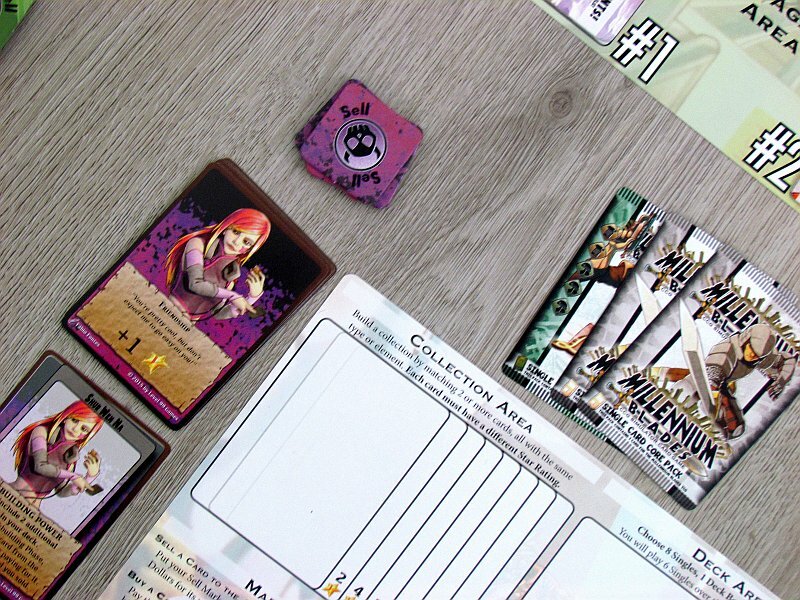 First part takes place in real time, but first players have to create a menu of cards in the shop – ten cards to choose from, but with a picture down. 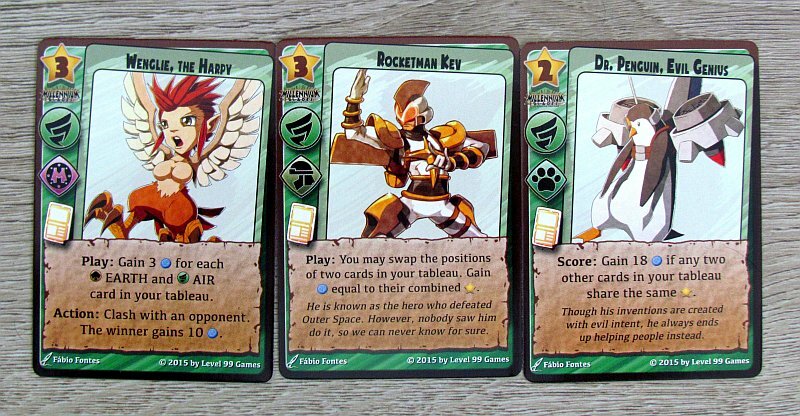 Players therefore only know, what kind of type it is, without chance to identify its abilities and value. 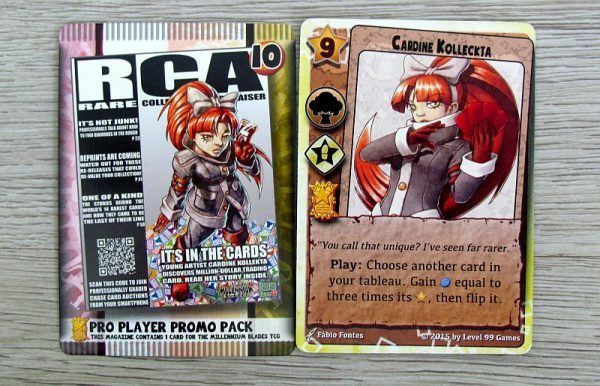 However, individual participants will also receive thirty dollars as pocket money and also new six cards into their sets. They have to be placed on the binder. 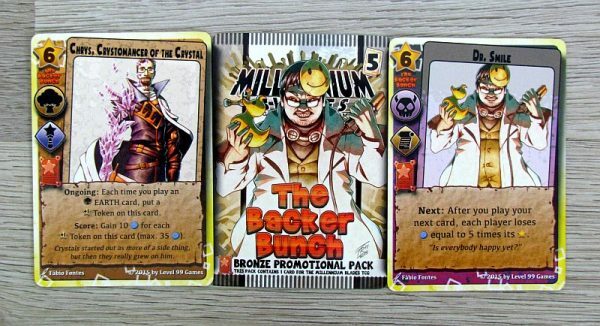 Then players have to reveal new meta card and set timekeeper to seven minutes. Their existing decks are placed also on the binder. Once the time starts, they are allowed to manipulate them. 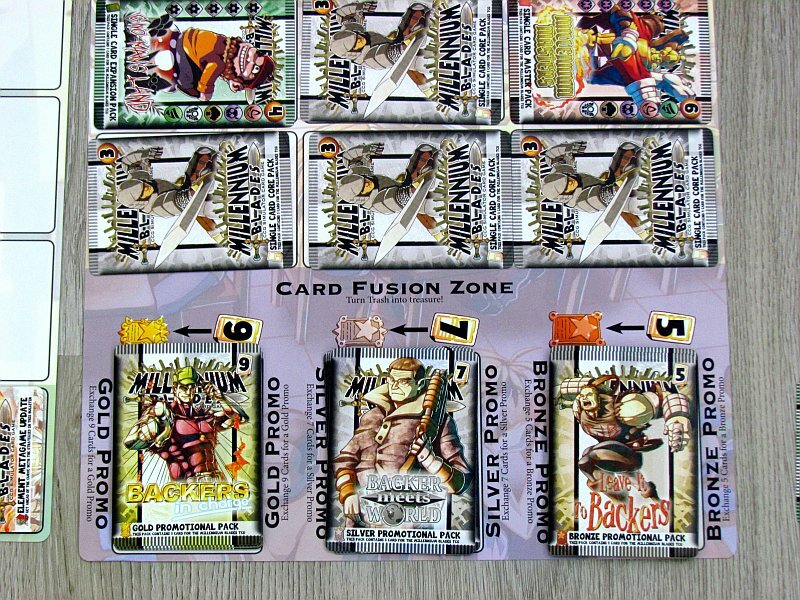 Within this phase, players can divide their attention exactly between seven actions, but all of them can be repeated as they wish. 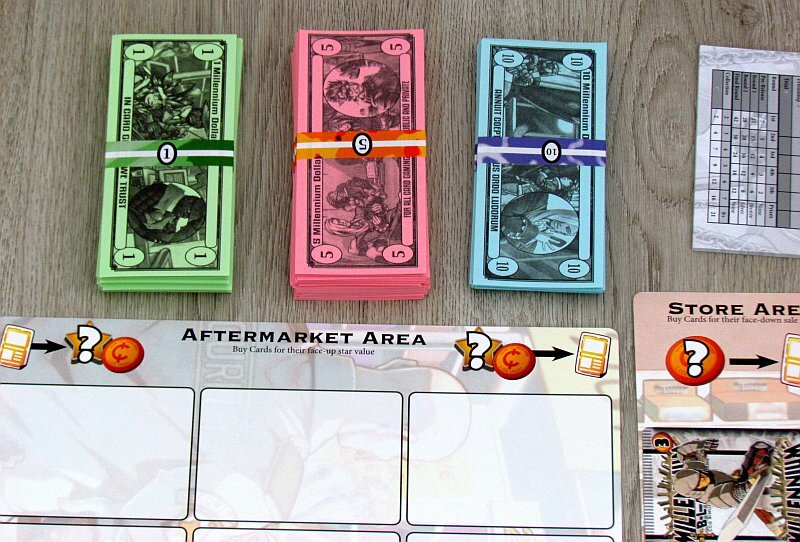 So player has to spend number of banknotes written in the top right corner, so he can blindly buy the card. Instantly, he replenishes the store. 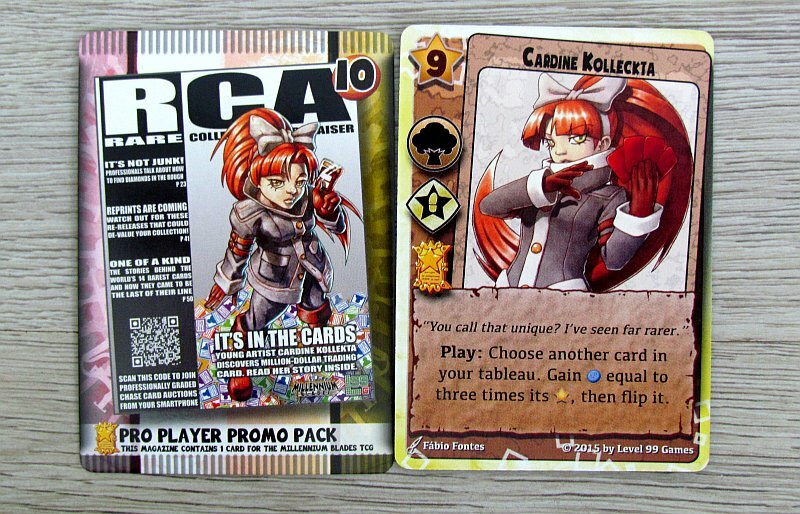 Players can also combine their acquired cards (with fusion action) to get a rare promo card. Or they can take any card out of their hand and put it on the sales card. It will lie there openly and anyone can buy it. However, players can also trade directly with each other, if this is of mutual interest. 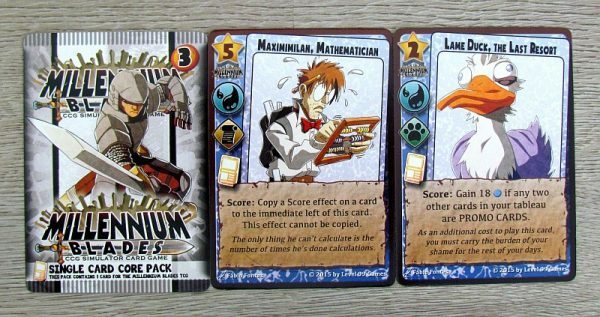 After the first seven minutes, players will re-set timer, get new set of six random cards and reveal new meta card. 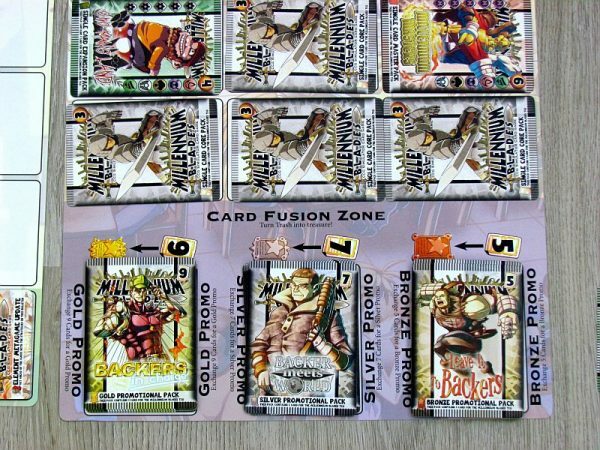 After the second time limit, there is a final stage, in which cards can not be placed out for sale, but otherwise there are no restrictions, what to do. Throughout deck-building, players try to create a set of cards for tournament. 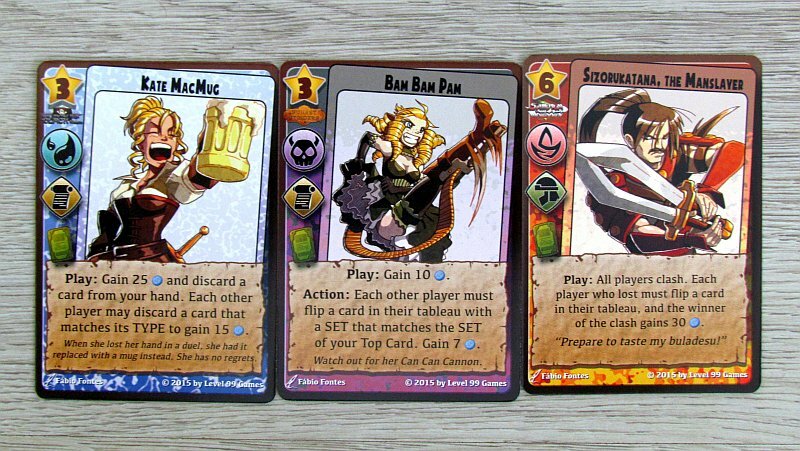 But only a limited number of cards can always be used to enter the tournament – battle deck can contain eleven cards together. 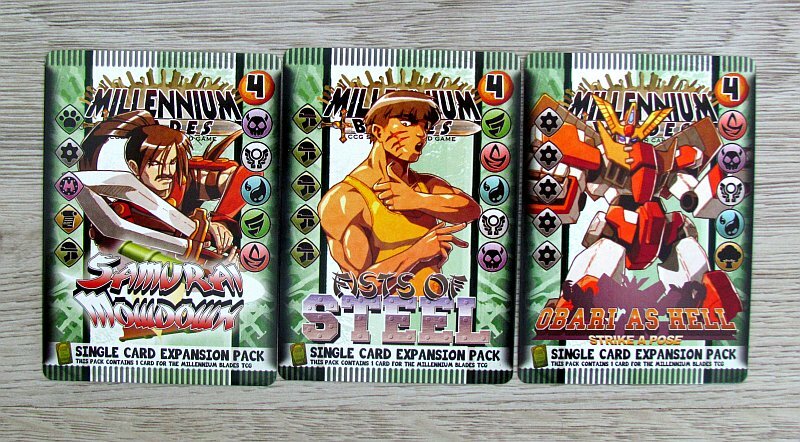 At the same time, however, they can also during real-time phase create sets of the same cards, that earn victory points immediately after the end of the stage. All remaining cards will remain part of the player’s binder for the next round. Then all the opponents will move to second stage of the tournament. 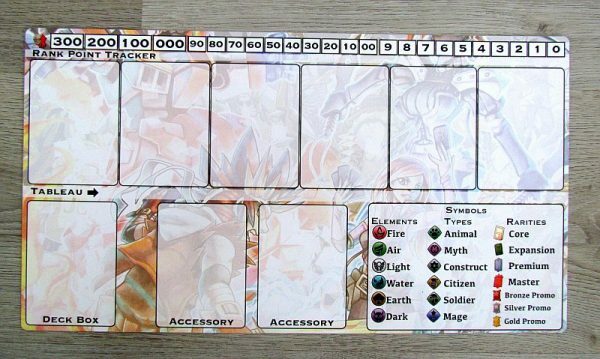 Players then turn their boards to the other side, mark zero on the level scale and reveal their chosen support cards – deck box and accessories, placing them on prepared fields. 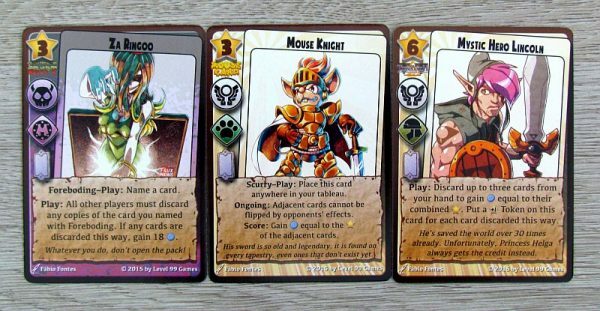 The remaining eight single cards are kept in their hands. 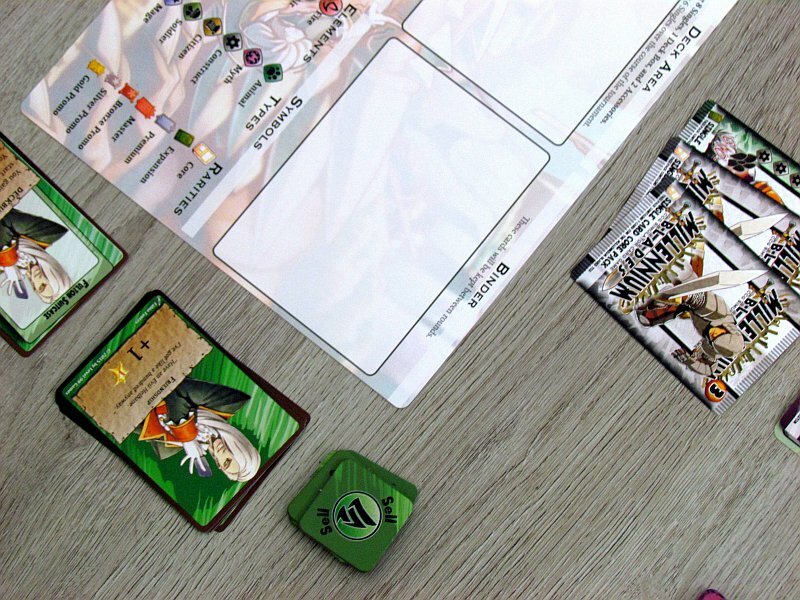 In his turn, player always takes one of the cards out of his hand and put it on the left most position of his tournament board. When doing this, he can also take action from already revealed cards. 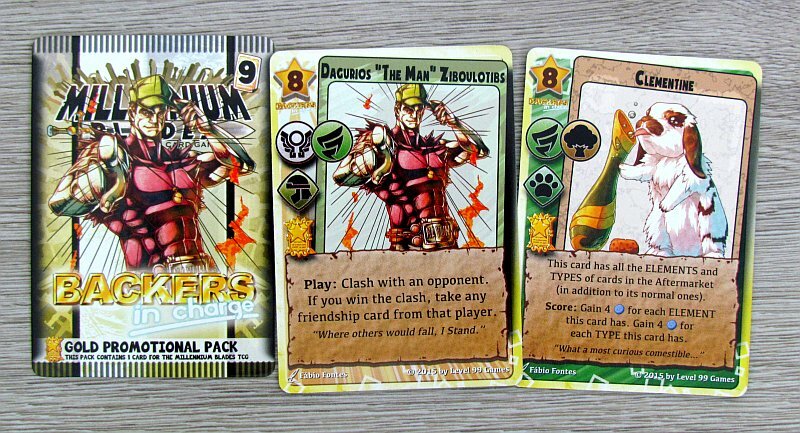 In all possible ways, players try to collect points of respect (levels) and spoil the same for their opponents. 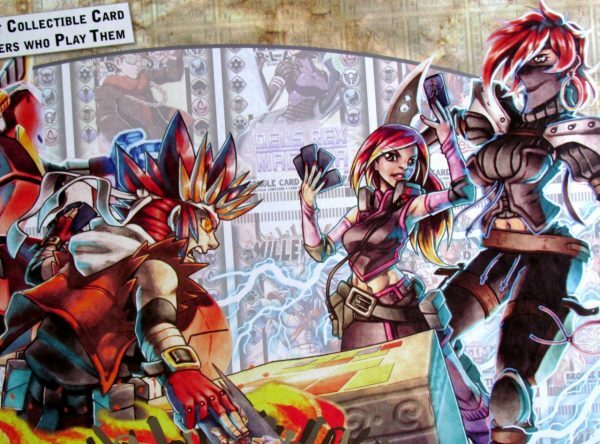 Part of the tournament is also a direct duel. Players measure forces by randomly revealing the upper card from the merchandise deck and adding its value to their chosen card for duel. But everything goes until the moment, where player no longer has any cards in hand. At that point, all participants will rank according to the number of points they have won in the tournament and receive a corresponding reward in victory points. Game then continues with new phase of deck-building, buying and everything with constantly ticking time in the background. Only at the end of the third and final round, after the tournament is finished, players will add up all their victory points and find out the winner and best collector. Millennium Blades is the ultimate card game. 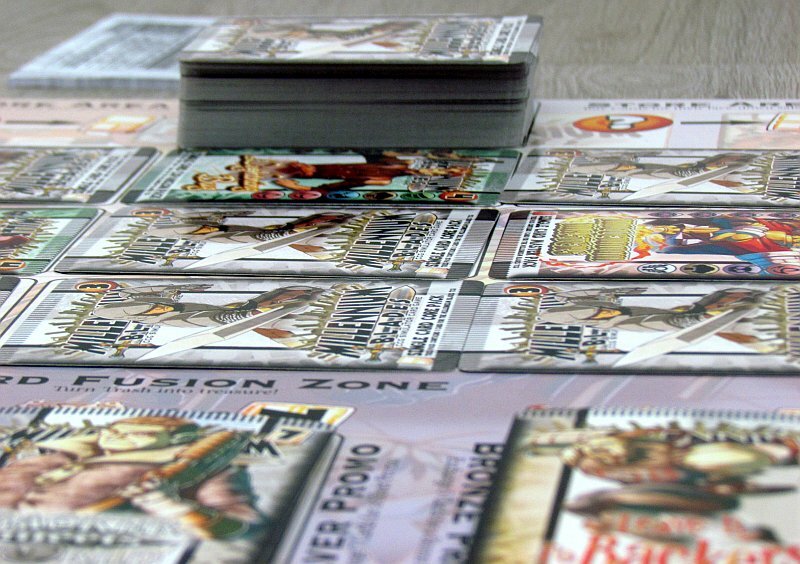 It’s hard to describe it otherwise, because its theme is really collecting cards and sets. Somewhere in the background, of course, we can guess the story mentioned at the beginning of our review. About the kings, monsters and magic, that rules everything. But it is two worlds and two realities away. We see our own and then the neighboring one, which is contained in the box. Player are in for an absolutely unique first phase, that takes about twenty minutes. Still, he will feel like its running away incredibly fast. That’s because your brain will boil from all the opportunities, and its not possible to do everything you want. 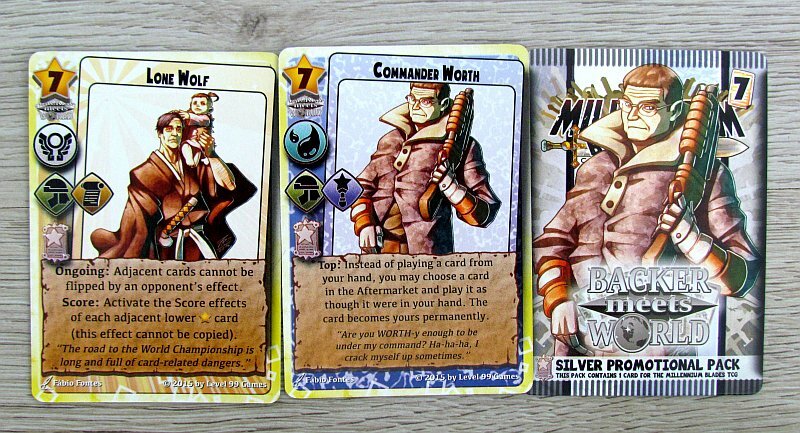 Building a deck is a completely different concept here, than in classic games like Dominion. There are no joint offers, quiet picking or boring turns. This is a stressful experience, in which you never get everything right. On the contrary, you often forget to make a decision or run away, but it is a natural part of the game. The author himself warns that players do not try to correct their mistakes. Instead, they should accept them, learn from them and continue. Errors do not mean, you can not win. In this game, you simply can not be perfect. The reason is a huge amount of choices and decision-making. Sometimes you work with limited information and you have to consciously risk. Like buying a booster deck of your favorite card game in reality. You also do not know, what’s inside and you still buy it. 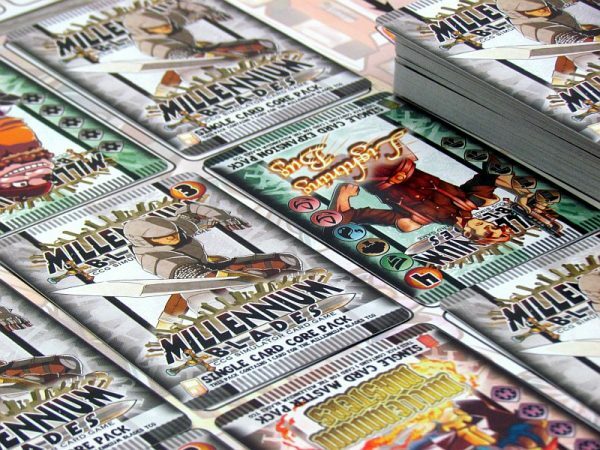 MIlennium Blades is a game like no other. It’s dynamic, but it’s definitely not short. Players do not need to steal cards, but instead they can exchange them. And they will receive a reward in the form of friendship points, that are also counted in the end. 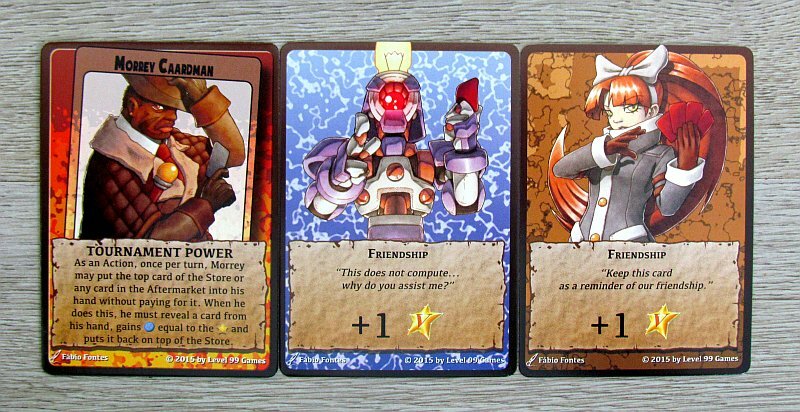 But then friends will become enemies as soon as the game reaches the tournament. The game is very conflicting in that phase. No, we will not tell you, that this game is for everyone. Its crazy and unpredictable rounds and a long game time easily discourages some players. But it does not matter. That means all the fun is left for you. 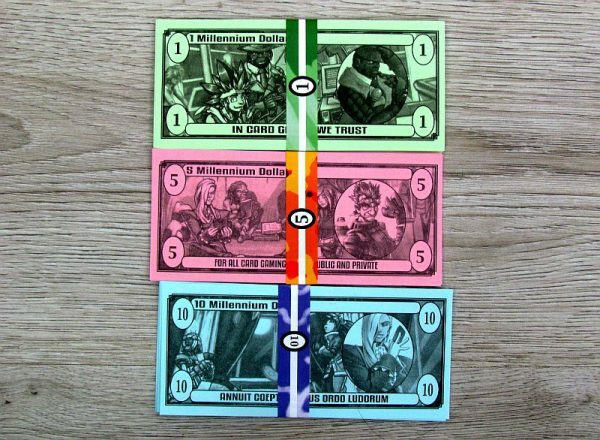 And do not worry, that you do not have anyone to play Millennium Blades with. 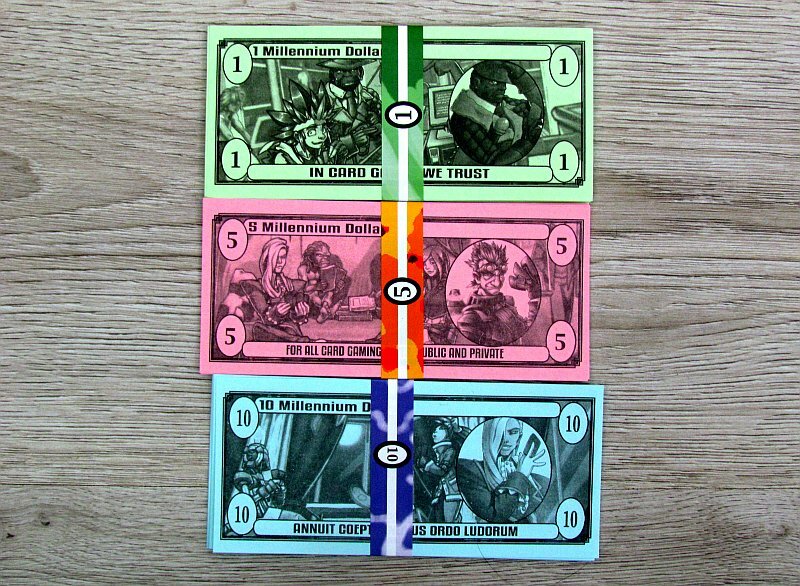 Anyone who has ever collected boxes of matches, stamps, or even beer caps, must like this game. It transfers exactly the enthusiasm and tension to the table. You always start again, but it does not matter. 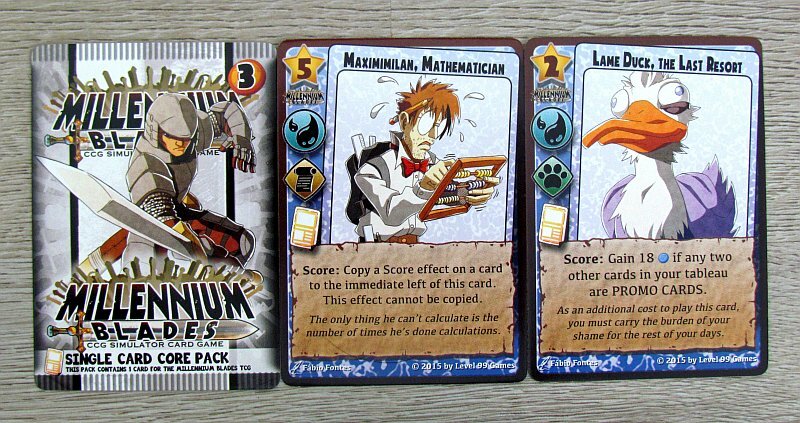 With a large number of cards, the variability of the individual match is guaranteed. 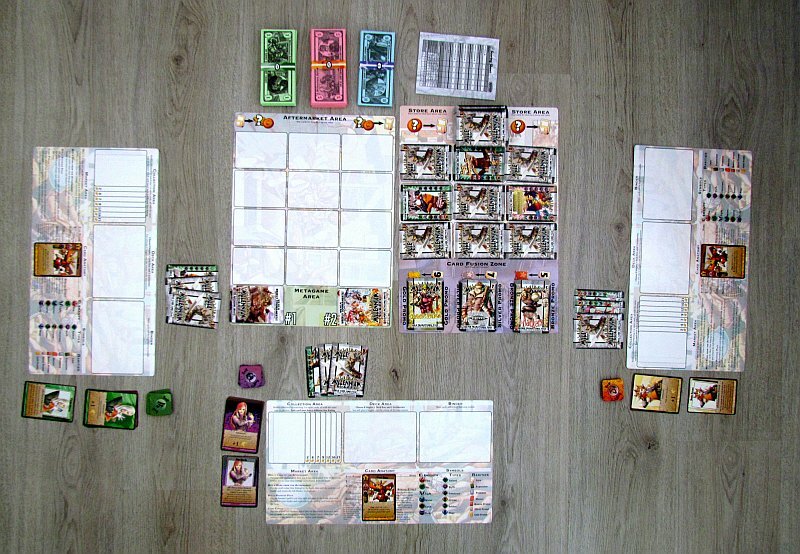 But the setup is long enough thanks to all the cards, which corresponds to the ambitions and size of this game. It is precisely this ambition, that best describes it, because the range is huge. 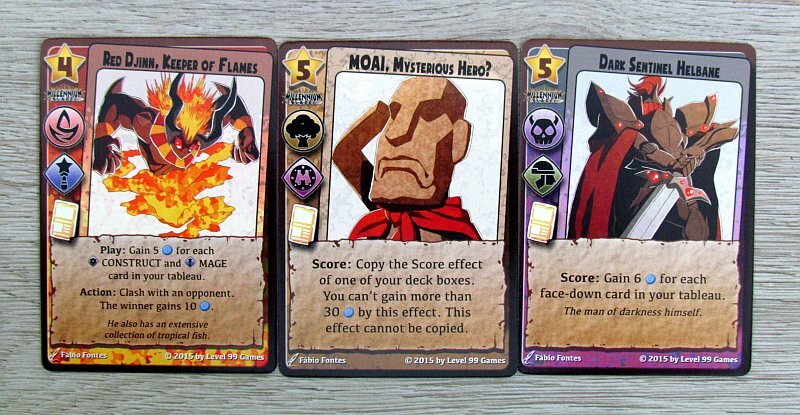 It is clear then, that cards can not be perfectly balanced. But that’s not the point. There are countless options and one strategy can respond to another one, even with a limited tournament card deck. Or learn from the loss for the next round. 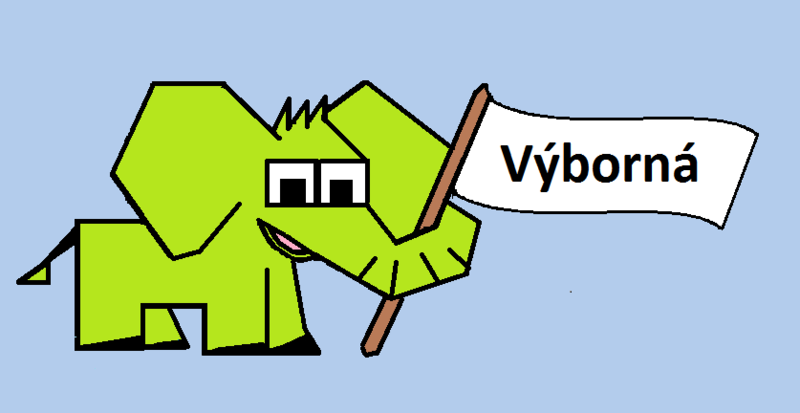 Victory is not lost yet. 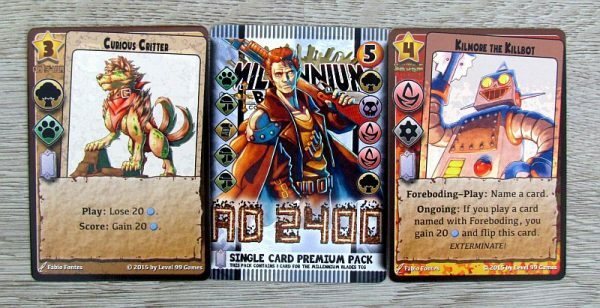 With more players, it may be too chaotic, which will reflect in the first phase. 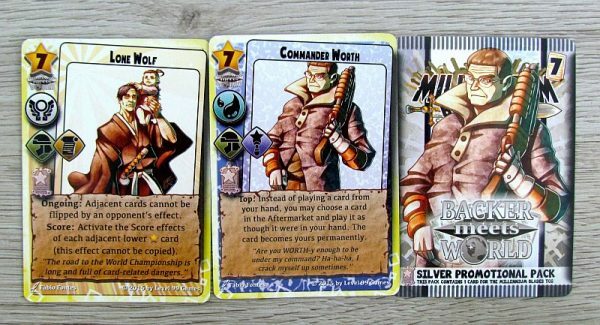 It is better to compete in building deck in lower numbers, ie in three, up to four. Even so, you should reserve at least ninety minutes to play it. 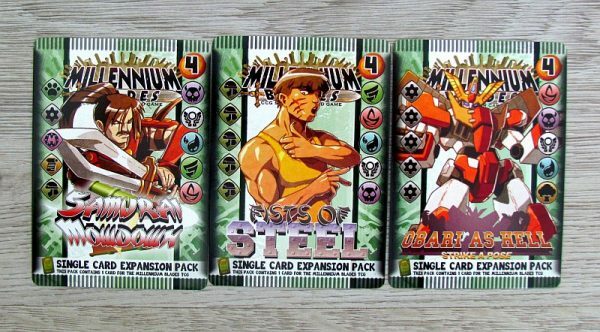 Millennium Blade is a card foolishness. That is, at least the first twenty minutes, when everyone plays at the same time without any unnecessary turns to hold you back. 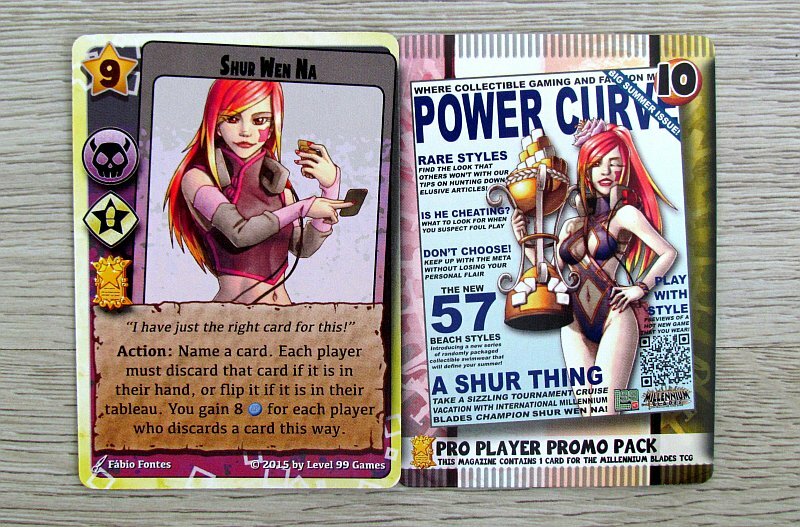 You perceive your opponent, because you compete with them for the cards on offer, but you can trade with them. Millennium Blades is a game, that has created its own genre and is an absolute king in it. 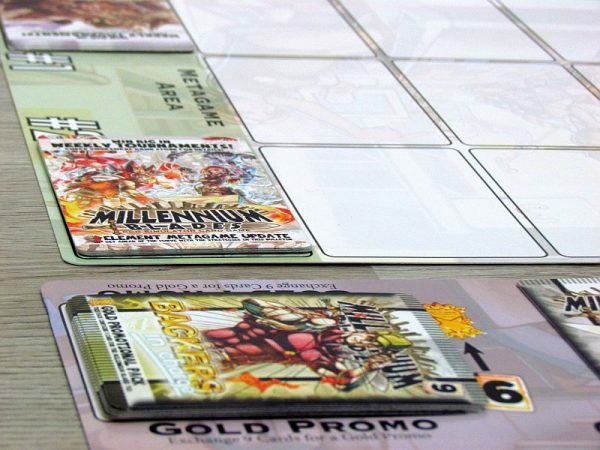 Autor D. Brad Talton, Jr.
Millennium Blade has nice anime graphics inside, and that's exactly like game. Unsettled, colorful and crazy from beginning to end. It gives you the tools to build a deck, but also great freedom. You can do what you want. 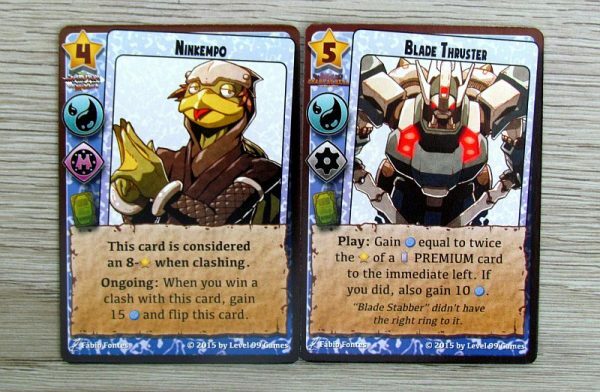 Just think of the fact, that you will need to build a competitive set from a your stack of cards soon. Tactics is needed to defeat your opponent. But the Millennium Blade is just real-time tactic game and in combination with its theme, it creates an absolutely unique experience, that is not for everyone. But if it suits you, then you will fall in love with this game.